If you dream of having a beautiful Wedgestone tea set but can’t handle the expensive price, then consider purchasing one of the miniature tea service sets instead. These small sets are not large enough to actually drink from but are attractive collectible pieces. This can be a way to have the beautiful set you desire but still stay within your budget. Wedgestone miniature tea services typically cost under thirty dollars. Bone china tea sets are stunning but incredibly expensive to purchase. 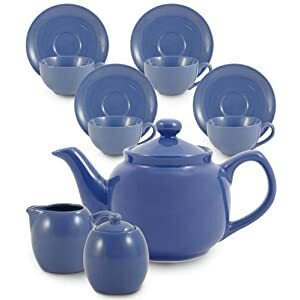 The Amsterdam tea set is an affordable way to enjoy tea without going into debt. The tea set consists of a two cup teapot, two saucers, two teacups and two small pots for cream and sugar. The set comes in a number of different colors and is a very affordable eighteen dollars for the entire collection. Most tea drinkers enjoy either a British breakfast tea or a green tea from Asia. True tea enthusiasts enjoy drinking from glassware that is suited to one specific kind of tea. In order to save money it might be worth investing in one set that looks great serving either a more traditional European blend or a Chinese jasmine tea. The Lanterns Tea for Two tea set consists of a beautiful red pot, a serving tray and two teacups that are decorated with an Asian lantern design. Perhaps you enjoy drinking freshly brewed tea but don’t often have guests to share it with. Consider purchasing a tea set for one. Stackable tea sets are a unique and innovative way to save space as well as money when on a budget. A small pot with a stainless steel infuser rests on top of a beautiful teacup as a way to enjoy brewed tea on your own. A tea set for one can be less than ten dollars and help you to stick to a tight budget while still enjoying your favorite teas. Many upscale and collectible tea sets are made from rather expensive materials such as bone china. Instead of spending a fortune on those sets, consider buying a beautiful glass tea set instead. The contemporary look of a glass tea set is the perfect way to serve either Asian or European brewed teas. The clear glass allows the color of the tea to come through in a very attractive and unique way, and sets can cost as little as twenty dollars apiece. Each of these five beautiful tea sets is a way to add to your tea set collection and enjoy freshly brewed tea without overspending. Consider one of them instead of a more expensive china set in your own home. No matter what you use, your tea will still taste great! Alison Greene is a tea-lover and freelance writer who blogs for http://www.debtmanagement.org.uk a site that can help you dig out from under debt with a debt management plan. As a stay at home parent, Mary Blanchard understands the importance of making her dollars stretch. She frequents the coupon croc site to access web discounts to stay within budget. Where can I purchase the teapot sets?